This Weekend in North Carolina events are pulled from July’s Dates & Events section in Our State magazine. Celebrate another work week’s end on the Burke County Courthouse lawn. There will be live music and food and beverage vendors; all you need is a chair or blanket. Nationally acclaimed painters from across the country will set up their easels around Cashiers to capture the natural beauty of North Carolina’s mountains. Their original art will be displayed for viewing and sale. Celebrating its 50th anniversary, Historic Flat Rock will host this annual tour of three of the oldest estates in town, all on the national register. The bond among Southern women in a beauty shop is incomparable. This much-loved play, which will be performed at the Duke Family Performance Hall, tells the story of friendship through humor and heartbreak. There’s nothing like biting into a ripe, juicy peach, and at this annual two-day festival, there are plenty of opportunities to do just that. 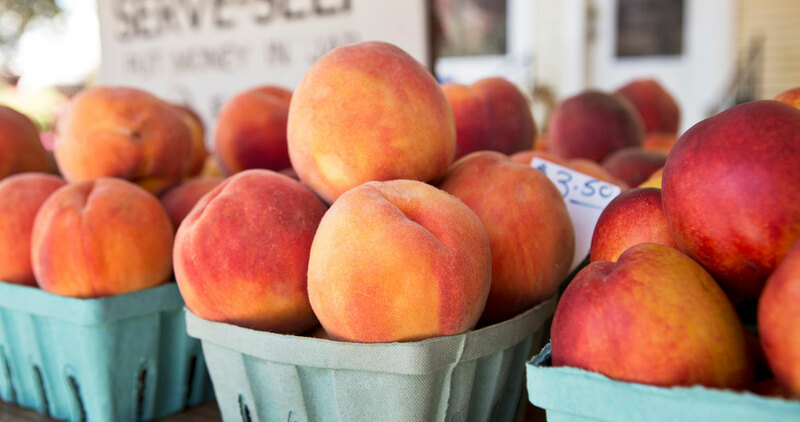 Enjoy sweet local peaches, art and food vendors, a petting zoo, and live music downtown. Bring your fold-out chair and enjoy rock ’n’ roll, oldies, and beach music outside the Museum of Coastal Carolina every Friday night as part of this summer concert series. Bands will include The Embers, Band of Oz, The Legacy Motown Revue, and Too Much Sylvia. Bring your flashlight on this nighttime tour of Oakdale Cemetery. With local historians as your guides, you’ll learn about the history of Oakdale, the Civil War veterans buried there, and funerary art.